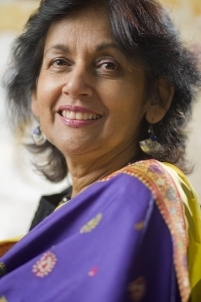 CHERYL BRAGANZA(1945 – 2016) was a gifted artist and poet. Of Goan origin, she was born in Bombay and grew up in Lahore where her parents owned Braganza Hotel (referenced in “Freedom at Midnight” Collins & Lapierre). After studying languages and the arts in Rome and classical piano in London, she moved to Montreal in 1966. Essentially self-taught, her subjects vary from evocative landscapes, lush florals to vibrant figures of Indian women. You can read her collection of poems entitled “Only Goodbyes” here. “We are glad to inform that Cheryl Braganza has been chosen for the MONTREAL WOMAN OF THE YEAR AWARD FOR 2008 . She helped for the cause of education of Afghan girls and women by contributing the entire sales proceeds of a specially prepared calender of 12 of her paintings, entitled “ONE WOMAN’S JOURNEY”, printed by the CANADIAN WOMEN FOR WOMEN IN AFGHANISTAN organisation based in Calgary. She says ” It was a project that kept me focused and exhilarated while I recovered from a difficult year of my life. It is basically my story in pictures and captions – and, an uplifting story, I might add. All the paintings, digital photography and writings are donated and I receive no money from the proceeds, except ofcourse a lot of satisfaction and solace knowing that I am contributing in a small way to the much-needed education of Afghan girls and women, whose plight is desperate;……….. all the while feeling good about reaching out to others in need. Cheryl passed away in December 2016, after a prolonged battle with cancer. In remembrance, her son wrote an Obituary which we quote here in full. all toward one another. This was my mother. began to paint in her 20’s and discovered that she was a gifted painter. this quote to heart or put it into action. writing than she produced in the previous 20 years. prestigious Women’s Art Society of Montreal, which she grew dramatically. from people she inspired across the world. played to sold out crowds in Griffintown for two years. only reality we have is that of right now, the present instant. magical tapestries of colour and love with her face, her voice and her mind. soaring to the beautiful places reflected in her art.